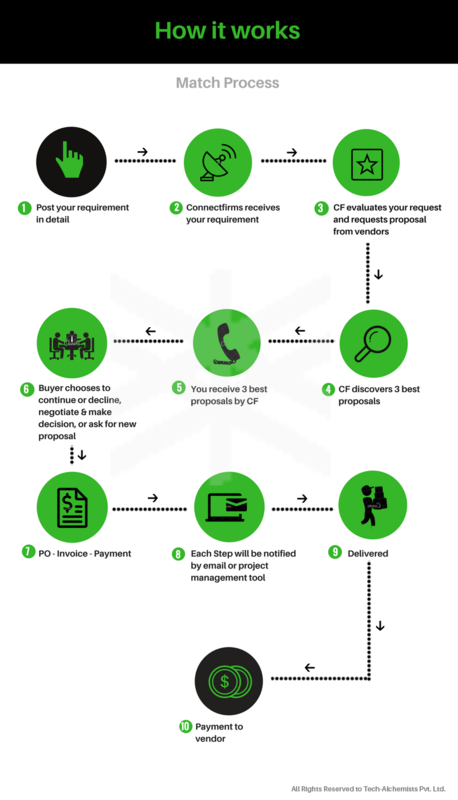 The following demonstrates terms and conditions of use (here-in-after referred to as an "Agreement"), applicable to your use of Connectfirms.com (hereinafter referred to as "web site"), which promotes business between suppliers and buyers globally. It is an agreement between you as the user(s) of the web site (the "User(s)") and Tech Alchemists Infotel Pvt Ltd. (hereinafter referred to as "TAI"). Before you subscribe to and/or begin participating in or using web site, TAI believes that user(s) have fully read, understood and accept the agreement. Web site acts as a mere venue/platform for our members to negotiate/interact for buying, selling, Promoting and other business services by way of locating companies to trade with, through our on-line exchange. We do not take part in the actual transaction that takes place between the buyers and sellers and hence are not a party to any contract for sale negotiated between buyers and sellers. All transactions will be the responsibility of the members only. This agreement shall not be deemed to create any partnership, joint venture, or other joint business relationship between TAI and other party. User(s) means any individual or business entity/organization that legally operates in India or in other countries, uses and has the right to use the services provided by TAI. Our services are available only to those individuals or companies who can form legally binding contracts under the applicable law. Therefore, user(s) must not be a minor as per Indian Law, i.e. user(s) must be at least 18 years of age to be eligible to use our services. TAI advises its users that while accessing the web site, they must follow/abide by the related laws. TAI is not responsible for the possible consequences caused by your behavior during use of web site. TAI may, in its sole discretion, refuse the service to anyone at any time. The service is not available to temporarily or indefinitely suspended members of web site. This agreement applies to all TAI services offered on the web site, collectively with any additional terms and condition that may be applicable to the specific service used/accessed by user(s).In the event of a conflict or inconsistency between any provision of the terms and conditions mentioned herein with those of the particular service, the provisions of the terms and conditions applicable to such specific services shall prevail. TAI may change, modify, amend, or update this agreement from time to time without any prior notification to user(s) and the amended and restated terms and conditions of use shall be effective immediately on posting. If you do not adhere to the changes, you must stop using the service. Your continuous use of the service will signify your acceptance of the changed terms. (a)	The contents of the Website including but not limited to the information, logos, designs, databases, arrangement of databases, user interfaces, response formats, software, audio, pictures, logos, icons, are the sole property of TAI or its licensors. All intellectual property in and to the Website and its contents and functionalities shall vest solely with TAI or its licensors. (c)	To the extent required, You grant to TAI a non-exclusive, royalty free, worldwide, transferrable, sub-licensable right to host, display, demonstrate, publicly perform, use, reproduce, format, and distribute any materials, trademarks, trade names and other forms of your intellectual property which You have provided to TAI (including the Website). (d)	You have no right to make any copies of the whole or part of the Website or any of the contents therein. (e)	You have no rights to remove, modify (including removing any copyright notices or proprietary markings) any part of the Website save for any User Information that belongs to you. (f)	You have no right to use any search mechanisms other than that provided on the Website and you will not use any web-crawler or any data harvesting tools to harvest data of any sort from the Website. Links to third party sites are provided by web site as a convenience to user(s) and TAI has not have any control over such sites i.e. content and resources provided by them. TAI may allow user(s) access to content, products or services offered by third parties through hyper links (in the form of word link, banners, channels or otherwise) to such Third Party's web site. You are cautioned to read such sites' terms and conditions and/or privacy policies before using such sites in order to be aware of the terms and conditions of your use of such sites. TAI believes that user(s) acknowledge that TAI has no control over such third party's site, does not monitor such sites, and TAI shall not be responsible or liable to anyone for such third party site, or any content, products or services made available on such a site. Most content and some of the features on the web site are made available to visitors free of charge. However, TAI reserves the right to terminate access to certain areas or features of the web site (to paying or registered users) at any time for any reason, with or without notice. TAI also reserves the universal right to deny access to particular users to any/all of its services/content without any prior notice/explanation in order to protect the interests of TAI and/or other visitors to the web site. TAI reserves the right to limit, deny or create different access to the web site and its features with respect to different user(s), or to change any of the features or introduce new features without prior notice. (a) If it concludes that the user(s) have provided any false information in connection with the member account to TAI, or are engaged in fraudulent or illegal activities. If TAI terminates user(s) membership, user(s) will not have the right to re-enroll or join TAI under a new account or name unless formally invited to do so by TAI. In any case of termination, no membership charges will be refunded. User(s) acknowledge that inability to use the web site wholly or partially for whatever reason may have adverse effect on its business. User(s) hereby agree that in no event shall the web site be liable to the user(s) or any third parties for any inability to use the web site (whether due to disruption, limited access, changes to or termination of any features on the web site or otherwise), any delays, errors or omissions with respect to any communication or transmission, or any damage (direct, indirect, consequential or otherwise) arising from the use of or inability to use the web site or any of its features. TAI provides an on-line platform for exchanging information between buyers and suppliers of products and services. Web site does not represent the seller or the buyer in specific transactions and does not charge any commission for enabling any transaction. Web site does not control and is not liable to or responsible for the quality, safety, lawfulness or availability of the products or services offered for sale on the web site or the ability of the suppliers to complete a sale or the ability of buyers to complete a purchase. User(s) are cautioned that there may be risks of dealing with foreign nationals or people acting under false pretenses. Web site uses several techniques (such as Verification) to verify the accuracy and authenticity of the information our user(s) provide us. However, since it is not possible in all cases and is not 100% fool-proof, TAI cannot and does not confirm each user(s) purported identity (including, without limitation, Verified Members). TAI encourages user(s) to use various tools available on the web site and otherwise, as well as common sense, to evaluate the user(s) with whom they would like to deal with. User(s) agree that TAI shall not be liable or responsible for any damages, liabilities, costs, harms, inconveniences, business disruptions or expenditures of any kind that may occur/arise as a result of or in connection with any Transaction Risks. User(s) are solely responsible for all of the terms and conditions of the transactions conducted on, through or as a result of use of the web site, including, without limitation, terms regarding payment, returns, warranties, shipping, insurance, fees, taxes, title, licenses, fines, permits, handling, transportation and storage. In the event of a dispute with any party to a transaction, user(s) agrees to release and indemnify TAI (and our agents, affiliates, directors, officers and employees) from all claims, demands, actions, proceedings, costs, expenses and damages (including without limitation any actual, special, incidental or consequential damages) arising out of or in connection with such transaction. User(s) may use the content/features on web site solely for their personal or internal purposes. User(s) agree that they will not use TAI database and/or services to send junk mail, chain letters or spamming or the transmission of any unlawful, harassing, libelous, abusive, threatening, harmful, vulgar, obscene or otherwise objectionable material of any kind or nature. Further, as a Registered User, user(s) will not use the Email Account to publish, distribute, transmit or circulate any unsolicited advertising or promotional information or any content that is obscene, indecent, seditious, offensive, defamatory, threatening, or which incites or results in causing racial hatred, discrimination, menace or breach of confidence. TAI reserves the right to add/modify/discontinue any of the features offered with a service. 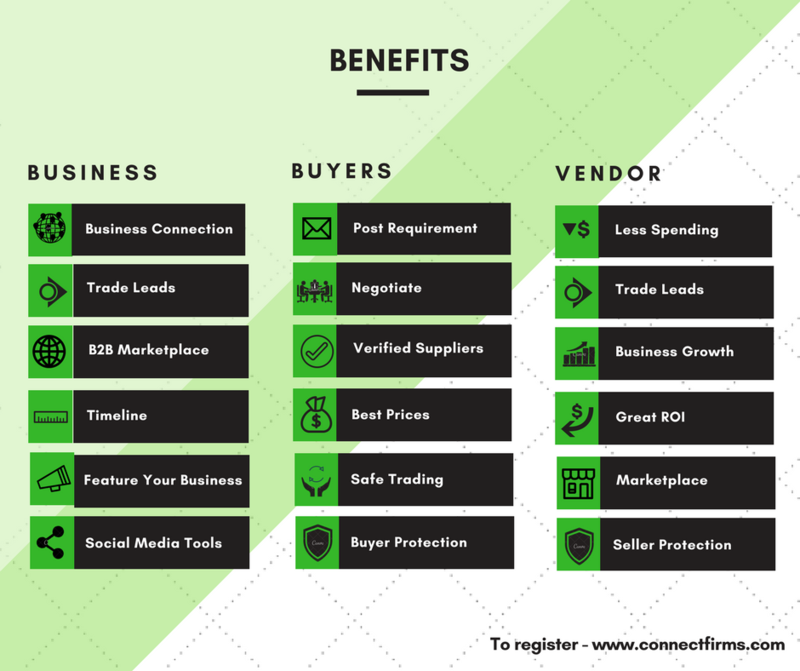 This ConnectFirms prohibited products policy (the “Prohibited Products Policy”) applies to all products and services exchanged on the business-to-business online marketplace of ConnectFirms, as available via the website www.Connectfirms.com, subdomains, other websites, applications or devices (“ConnectFirms Marketplace”). Any natural person that signs up as a registered user or premium member to the ConnectFirms Marketplace (“Member”) is responsible for adhering to local laws and regulations, both in their own country and the targeted country/countries, as is outlined in our Terms and Conditions. This Prohibited Products Policy is therefore not to be considered extensive. We recommend you always consult local laws and regulations, as well as the current version of the Prohibited Products Policy, before adding an offering of a product or service to the ConnectFirms Marketplace (“Placement”). Placements or other content regarding products or services which are unlawful, in violation with our Terms and Conditions or Policies, or considered inappropriate and undesirable for the purpose of the ConnectFirms Marketplace, can be removed at our sole discretion. Gift cards and re-loadable cards can be risky for buyers because the balance can’t always be verified and sometimes the card balance can be used or cancelled by the original purchaser. •	Items that promote, support, or commemorate groups with views of hatred or Items that depict or glorify violence against people or animals. •	Offer for sale products from multi-level marketing companies, network marketing companies, or companies that use direct selling, referral marketing, or pyramid selling are strictly prohibited and are subjected to immediate removal.